NEW YORK (CNNMoney) -- If you thought having thousands of Twitter followers made you famous, how about showing up in a reality television series? Bravo announced plans on Wednesday for two new shows focused on the tech realm. The network is teaming with Facebook founder Mark Zuckerberg's sister Randi Zuckerberg, who left Facebook in August to start her own media company, for a series with the working title of "Silicon Valley." According to Bravo's site, the show "captures the intertwining lives of young professionals on the path to becoming Silicon Valley's next great success stories." It's too early to tell say whether Facebook founder Mark Zuckerberg will make a cameo. Perhaps instead of cat-fights, viewers will see code wars and hackathons. Bravo was mum on the details, and Zuckerberg -- that's Randi, not Mark -- did not immediately respond to a request for comment. Bravo also unveiled plans for a tech series with the working title called "Huh?," giving viewers an inside look at the crew behind ICanHasCheezburger.com. 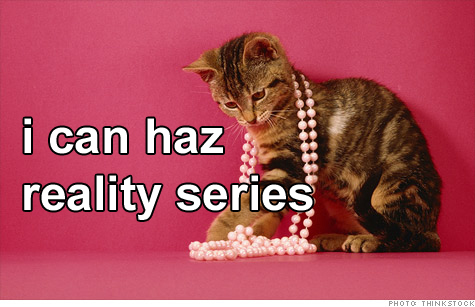 Run by entrepreneur Ben Huh, the Seattle-based Cheezburger, Inc. is known for LOLcats, FAIL blog, and its empire of Internet memes. Bravo has frequently teamed up with buzzy tech startups, from Foursquare to TaskRabbit, to promote its shows, so a show tracking the young founders behind many of those startups isn't a complete surprise. Let's just hope "Silicon Valley" doesn't end up titled "Real Entrepreneurs of Silicon Valley."